The WMSU delegates together with the other participants of the event. Three students of Western Mindanao State University placed first in the Millennium Development (MDG) Quiz Bowl held at Sarabia Manor Hotel and Convention Center, Iloilo City. Student Regent-Alvin Rex M. Lucero (Bachelor of Laws), Manuelito C. Siason (Bachelor of Arts, Major in English) and Era Mae Hufana (Bachelor of Science in Electronic Communication Engineering) represented the university during the said contest. WMSU outdid other prestigious schools like Dela Salle University, University of the Philippines-Diliman, Silliman University and Ateneo de Davao University. 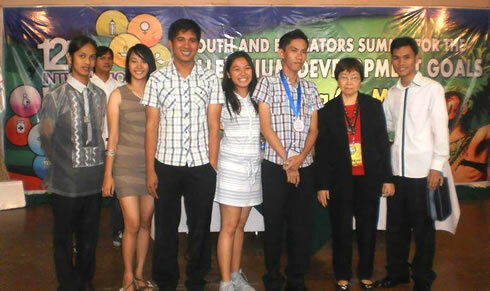 The quiz bowl was part of the 12th International Youth Day Celebration held last August 3 to 7. The five-day conference seeks to provide a venue for dialogue and cooperation across an ethnically diverse and socially responsible group of student and youth leaders. It aims to mobilize young people to contribute to the United Nations and of the country’s Millennium Development Goals campaign. Anchored with the theme, “Volunteering for MDGs: Discover the Volunteer in You”, the confab also desires to gather youth leaders and educators in the Philippines and Asia Pacific Region; share and process their experiences; identify their strengths and weaknesses; and enhance leadership skills, techniques and strategies in the pursuit of the UN Millennium Development Goals. Moreover, it wishes to strengthen youth volunteer programs in the pursuit of MDGs among youth groups like the student councils, Sangguniang Kabataan and UNYAP Chapters in the region. Lucero, Siason and Hufana together with another WMSU student, Deanna Tricia Mendoza (Bachelor of Science in Nursing) are among the 400 student and youth leaders throughout the country and from other 15 different countries. Activities during the confab were debates on varied issues, delivery of speeches by the participants, draft resolutions and plenary sessions. In addition, it is rightful to mention that the delegates were also elected to key positions of the United Nations Youth Association of the Philippines. Elected as the Regional President of UNYAP-Region 9 was Alvin Rex Lucero; Deanna Tricia Mendoza as the Regional Internal Vice President; and Era Mae Hufana as the Regional External Vice President.